I know you wonder what are those that bother me, well let me use this opportunity to share my feelings with you. As a graduating college student there are a lot of issues and aspects of my life that affect me. Career and lovelife are the two main aspects. Which will you choose? your career (of course) or lovelife (that inspires you to go on with your career). Lovelife. I have been eyeing this girl for almost a year now, i mentioned her in a post already (Click this to know the story) .For a month, i've been calling her. I know she treats me as her friend and um, yeah, i was wondering what could we be? haha. Then just a few weeks ago she invited me to come to an event where she's a part. *Siyempre ang lolo mu may effect na hindi kuno pupunta pero excited* . Then i was there, i was with our school's communications department for a tabulation of votes for the event. She looked for me. And.....yeah, i saw her again after months of not seeing her, i wondered how she became, the changes. *siyempre ang lolo mu kinilig, pero hindi ko pinahalata*. Althroughout the night i was only looking ONLY to her. She's so beautiful though there are a lot of beautiful girls at that night. *Siyempre hindi ako nakatulog pagkauwi namin, nakatulog man, siya pa rin ang laman!, haha keso?*. I asked her out and she accepted. I thought of going out to a mall but i think it'll be romantic to go to Luneta. That's my dream date actually, and with her, yeaaaaaah, that's a very dream come true!. hell men! yeah!. But i still don't know a lot of details about her, baka naman panay ang pagkahulog ko iba na pala ang nasalo niya. And i was so damn right!, she's taken already and i knew it at the night before we went out. So, the excitement for the date turned dowwwwwwwwwwwwwn!. But i was still hopeful. The day of the date came. I was nervous. Mr.OC. I didn't tell anybody until the date happened, i was not certain until it happened. She's late for like 3 hours or four and i was nervous that she might won't show up but thank God she came. On our way she keeps on mentioning her boyfriend, her life and her problems, of course i have to be sympathetic, or else she'll find me arrogant. I bet she's upset when we're on our way to Luneta cause; a date to Luneta at 5pm?, what the?, her boyfriend calling and some issues keep on coming on her head. then went on, talking again about her boyfriend that i wish i could make her forget about him and her issues and just enjoy the day. Then the ride to kalesa happened. *on our way to Rizal monument, ngumiti si manong kutsero samin, nagkatinginan kami at nagkangitian at "hhhhhmmm, tara! ", "tara! "* My dream is to ride on a kalesa with a girl, my love, but a single and has no issues. So that was isn't a dream come true. Suddenly i realized, it's her day, it should be and i should make her happy. We enjoyed it. Yes we really did. We were like, "i wish we could extend this day!". Then she said "why don't we come back here by next year, with the same kalesa, same time and day?". I am not sure about the future so i did not promise but i said "I'll try" We went over to some historical places around the metro, with this girl, we're happy, perfect!. After that, we went down to the same place where we took the kalesa, Then the lights and water show amused her and said "wwooooooooow, ang ganda". The moment she said that, she held my hand and pull me to go nearer, then there's a music *Kulang nalang camera pelikula na*.My heart was beating fast. I WAS IN LOVE AT THAT MOMENT!, oh yes i was. She told me she's happy, she have forgotten her problems, we were holding hands i bet. I would love to kiss her but this is only our first date and there are a lot of people there. *iskandaloso*. And she's taken! We plan to go home early but, we enjoyed the day that it's almost midnight when we came home. I was holding her hands as we cross the streets of manila and as we go home. We were talking so many things about us, both of our lives, family, individuality, plans and things. I would Love to repeat that jeepney chat *Front seat* from Manila to Bulacan. I am still inlove until to this very moment that i am reminiscing our date. She's my first date. She's not my first love but definitely she's my friend and i know that. I love her, that i would kiss her if I'll see her again, even if she'll get mad after reading this post or while I'm kissing her. If that kiss happens, she'll also be my first kiss!. Career? i bet i have lost my emotions and text to write something about it now cause obviously, the post is too long that i am overwhelmed by that girl and of our day together. Also, i think my career, thesis and engineering life has been said to much already!. Nainggit ako. ;/ gusto ko rin makita ang luneta. T_T it was last year pa nung huling punta namin. ang ganda ng ilaw at water effects. argh! anyway, pro RHbill ka ba? HAHAHA. gumanda na ung luneta.... gusto ko nga rin pumunta dun eh. hahaha. inggit ako sayo! assstttiigg! at alam mo..kinilig ako sa unang part ng post mo... kaso nung nabasa ko ung SHE'S TAKEN... parang nanlumo rin ako. lol. but who cares? hindi pa naman sila mag-asawa eh. nyahahaha. Wag ka masyado padala sa bugso ng iyong emosyon. Kaya mo yan iho. At saka hmmmm...kawawa ka naman. Kasama mo yung crush mu tapos yung pinag-uusapan ninyo yung BF niya. Kung paipiliin mo ako sa career at love, ang pipiliin ko ay career. Yang love dumarating yan sa tamang panahon. Dapat you are in the right place para kung labas yung opportunity then you grab it. Sweet naman! Sana matuloy yung next year, same time, same day, same place, same kalesa!! You can never tell what the future brings. Don't lose hope. Wish ko na maging kayo in the near future. Romantic blog entry you have here! Your description of particular details of your date leaves a reader squishy and reminiscing. Hope to read other "romantic blog posts." Heh! Heh! What i know about Luneta is.. its the perfect place to watch people doing their own things. Amusing. 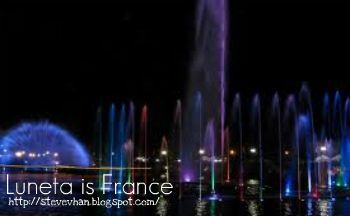 True enough that Luneta's PH's France. Great posts, you just have to watch with some SV-agreements.